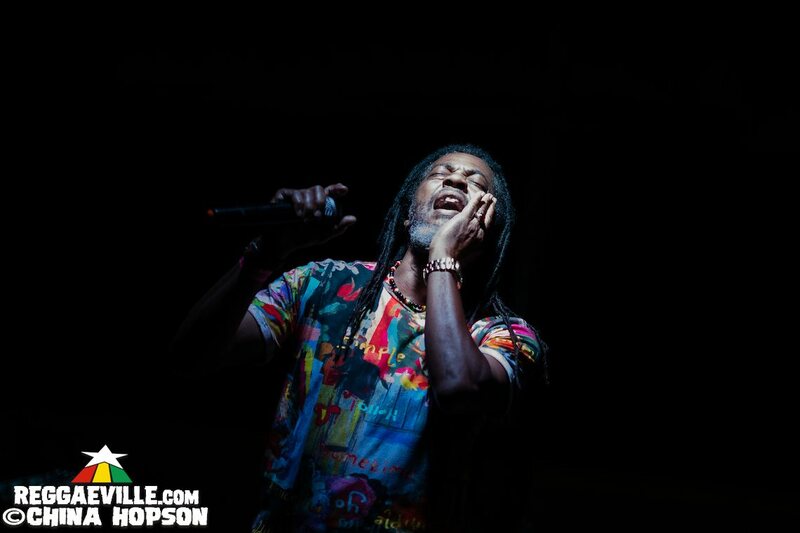 Last weekend, Negril belonged to the Stepping High Festival for the 16th time. 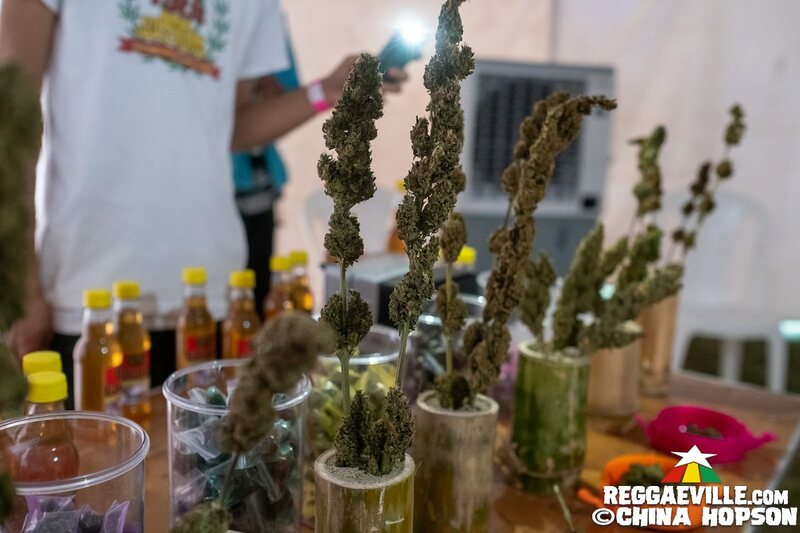 Since 2004, the annual festival gathers farmers, manufacturers and visitors involved in the multi-faceted Ganja trade - and artists, of course. Illegal and thus underground until 2015, the festival gained momentum after the de-criminalization act in 2016, and has now grown into a recommendation for both industrious locals and foreign visitors wishing to extend their stay for Reggae Month just a few days further. 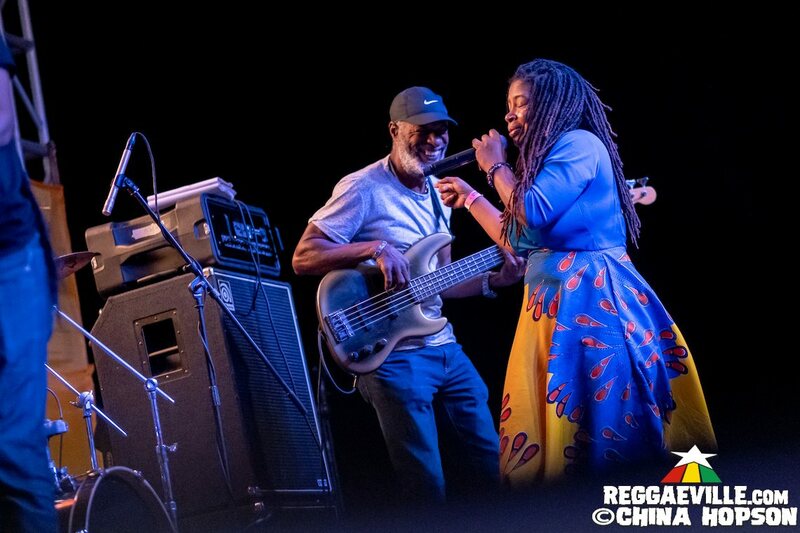 Reggaeville has been on the spot for you to report on this relaxed, welcoming event on Jamaica's Westcoast, so read about the experience, look at the pics and make sure you consider a visit for the 17th edition next year! DAY ONE - MARCH 1, 2019 (Underground) PHOTO REPORT HERE! Changing the location of the opening night to the place where it all started, it was fittingly termed "Underground". Situated at Negril's Westend close to the famous Rick's Café, the yard is comfortably situated between trees and grass patches, and the stage sounds lead me through the warm Friday evening that has already fallen. Due to an unfortunate delay of my flight, the opening performance of Mystic Revelation Of Rastafari at 5:30 pm is lost to me, as are those of Dub Poet Scripture and Kyan. Upon entering, somebody that sounds like a male version of Tracy Chapman is performing his last song, an artist called Ice Block. After him, Akinsanyah and his guitar are on, followed by another Dub Poet by the name of Jack of Spade. The Rastafarian elder is a Negril resident, as it is part of the festival's philosophy to support local talent. This maxime doesn't prevent them from booking artists from farther away, as the next act shows: Aza Lineage! The singer outta Kingston is here with her Lineage Family, and her performance is definitely my highlight of the night. With her powerful voice and her positive stage presence, she captures the audience, presenting original songs such as King Of Kings, Herbs & Music, Soundsystem or Where I'm From, professionally backed by the Prophecy Band. If her name does not yet feature on your playlist, make sure you check her out! After a change of moderators, the program is resumed by Singing Vernon, who starts with a cover of Them Belly Full that turns into an improvisation of his own, singing about the injustice still so blatantly evident in our world. A fervent supporter of Ganja himself, the artist couldn't showcase in a more fitting setting. Taking a stroll among the stalls of Ganja farmers and exhibitors, you can purchase anything from seeds over creams and oils to crazy amounts of herb in a wide variety. Fresh fruit, drink and ital foods round off the sensoric experiences this festival has to offer, and even though it hasn't drawn a big crowd as yet, its relaxed atmosphere makes it a pleasure to attend. Switching the attention back to the stage, the artist named Prophecy meets the band by the same name. And what a great fit that is! Starting his set with a tribute to Buju Banton (Murderer), he continues with music of his own such as New Found Love, Puff & Pass and Don't Come Tell Me. Meeting the artist after the show, he further impresses us by talking about the Prophecy Youth Foundation he has launched, collecting money to provide children's clinics and hospitals in Jamaica with urgently needed medical equipment. When the program is about to resume, the moderator surprises us with an announcement: "Before we continue, let us big up the foundation, big up Lee "Scratch" Perry in the house!" Whaaat? Indeed, the small man steps up to the stage, delivering an obscure message about Jesus, Babylon and Ganja. Giving thanks for this legend's presence! When he comes off the stage, the last artist of the night is about to start. Principal Grundy is well-known locally and appears on stage in a beautiful outfit. With the Prophecy Band, he takes a riddim-wise ride through Reggae history, delivering covers like Bam Bam or Rivers Of Babylon with his sonorous voice. Final and closing act for the night is Jungle King, introduced as the Fire Man. The slim shaman appears with a bunch of burning torches, swirling them through the air as if they were sticks. To the backdrop of African Drumming, he dashes here and there, lets the flames lick over his bared chest and even spits fire several times, the emanating heat reaching us even in the safe distance. With such a warm ending, the first day leaves us yearning for more, and we are more than looking forward to tomorrow's continuation! DAY TWO - MARCH 2, 2019 (Cayenne Beach) PHOTO REPORT HERE! After the first night of the Stepping High Festival had us up rather late, the announced early start at 10 am on its second day is rather illusionary. Even more so when, from around noon, heavy rains make it almost impossible for the stage program to begin. Thus, we take our time and arrive at the festival grounds by 6 pm. Air washed clean by above-mentioned liquid sunshine, today's spacious location at Cayenne Beach allows for a pleasant stroll among the stalls. Stopping here and there for a little chat, we learn that Yakub and Ryan (Yardreel) are in charge of filming the festival, so make sure you check out the Stepping High Homepage for this footage! Also, we finally take the time to check out what's going on at the Space Station. Being a Ganja Festival, of course the herb is in focus, and here, visitors get the chance to participate in voting for this year's best Ganja farmer. Ten local cultivators were able to enter their Ganja stalks, and all ten can be looked at, smelled, felt, tasted... On a voting card, visitors can give points from 0 to 10 for the categories "Presentation (looks), Fragrance, Taste and THC". Last year's winner, as later announced on stage, is a guy called Wabba (Wabba's Weed) with his powerful Dark Star. On stage, Selector I Jah Stars plays a diverse warm-up set, to the sounds of which we continue our little round-trip. Behind the Space Station tent, an elaborately decorated car catches our attention. Talking to the Ras standing in front of it with a chalice, we learn that he is the originator of this car's design, and that he's not only a visual but also a performing artist by the name of King Jesus, scheduled to be on stage later on. At 6:30 pm, the Mystic Revelation of Rastafari get ready for their opening ceremony. Nine people on stage in total, they immerse us in the captivating sounds of Nyabinghi drumming and chanting, with songs like Fly Away Home, New Name or Rasta Never Got Weary Yet inviting for extended sing-alongs. The program continues with Dub Poet Scripture, who presents a piece called Surviving Cancer that talks about the poisonous effect of genetically modified foods and the general toxic atmosphere in huge cities, and Wizaya the Ganja Minister. In between, DJ Ilawe takes turns with Principal Grundy to bridge the breaks, and we also see the Jungle Man of last night again, firing it up once more. The next big act on stage is the powerful singer Isha Bel, coming all the way from Kingston. She delivers her original compositions Red Eye, Green Rights, Locks Grow and So High, backed by the Stepping High Band. After her, King Jesus is up, and although it's interesting to look at his acrobatic movements on stage, his stronger talent seems to be the visual arts. Jah Izrehl, who appears next, is a great singer, and the subsequent show of Addis Pablo lifts the artistic quality of the night to new heights. In a tribute set to his father Augustus Pablo and other foundation musicians, he performs overdubs on the Stalag Riddim, the Java Riddim, Satta Massagana or Bob Marley's War, to name but a few, filling the tepid night with his melodica's sounds. Those who are interested in some original Addis Pablo Dubs, check his recently released EP King Alpha And Queen Omega! With a change of moderators, Mr. Grant (Irie FM) announces singer Dann-I, who has worked hard at the Space Station already. "This is not just an event, this is a movement!" he says before launching his energetic show. 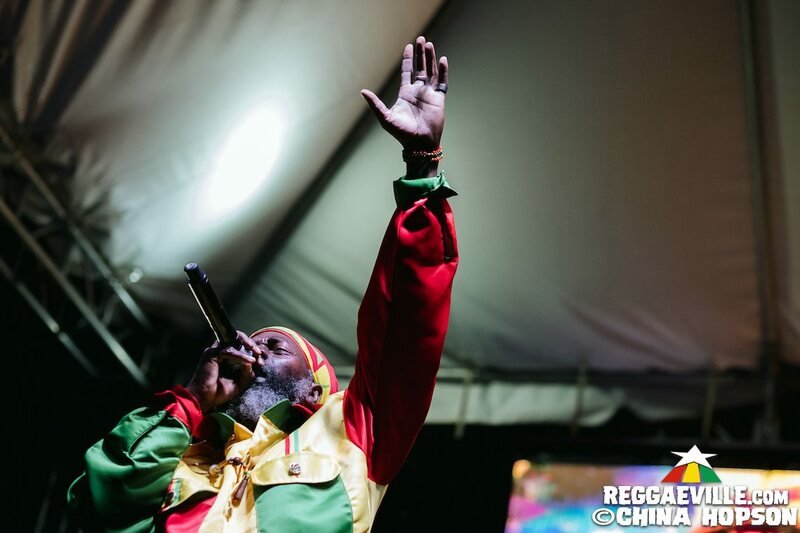 With songs like So High, Time No Wait and Grabba Lova, he leaves a lasting impression and is the first artist to be called back for an encore, just when he was about to take a picture with Lee Scratch Perry backstage. The living legend, however, just follows Dann-I on stage, filming everyone and everything with his mobile. At 00:30 am, tension rises and the place has filled up considerably, as a band change heralds the coming act: Capleton and his Prophecy Band are up next! 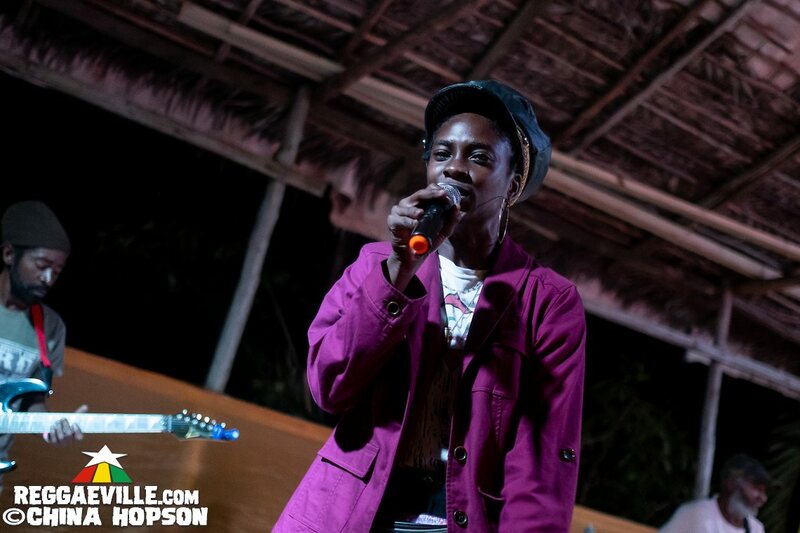 The Fireman appears in a dazzling outfit, as usual, and, likewise as usual, has the place in his firm performer's grip, generating lively response from the audience with tracks like Jah Jah City, Slew Dem and Rocky Road. Lyrics Machine! With a calmer, but equally high-quality performance, I-Wayne closes the evening. He presents Chanelle, daughter of the legendary Clancy Eccles, who not only backs I-Wayne in his hits like Living In Love and Don't Worry on the Waiting In Vain riddim, but also sings on her own - and beautifully so! Introducing his latest release Golden Touch, the stage show comes to an end, and people use the opportunity to socialize a bit before the festival grounds are cleared. We look for festival founder and organizer Lyndon Connell to thank him for the warm welcome and another amazing experience, and then, going for a last Jelly Coconut, return to our Judy House Cottages for a good night's sleep. Thank you, Stepping High Festival!!! CHECK THE PHOTO REPORT BY CHINA HOPSEN HERE!